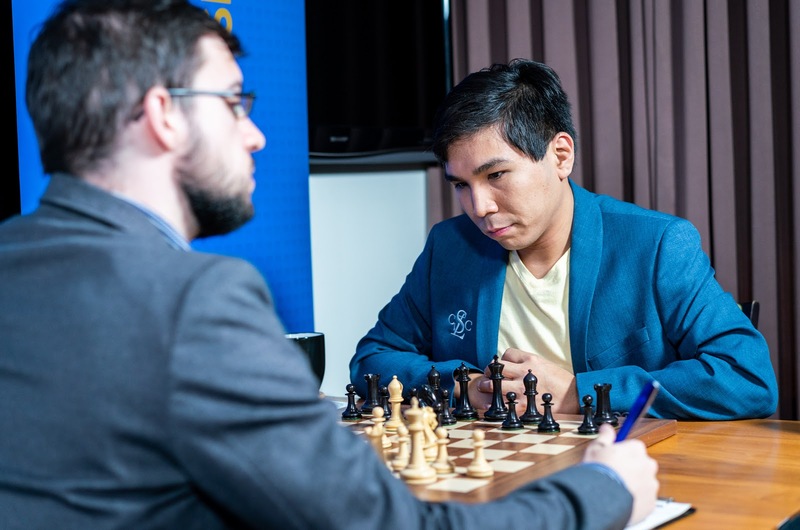 The fight for first place and the ticket to the Grand Chess Tour finals in London is getting tighter as now there is a four-way tie for first place. 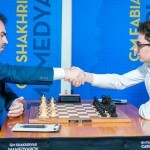 After Shakhriyar Mamedyarov, Magnus Carlsen, and Levon Aronian drew their games, the door was wide open for Alexander Grischuk to enter the leaderboard. 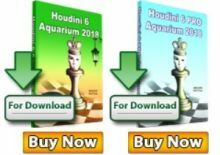 The Russian Grandmaster delivered the only decisive result of the day by defeating Hikaru Nakamura in a 6.5 hour battle. With each round, the competition is getting more tense as the players fight until the last minute on their clocks for those GCT points. Just as was the case yesterday, the only win of the day was a 6.5-hour grind. Grischuk achieved a superior position after the opening with the black pieces and pressed the entire game. His advantage grew until his opponent was forced to give up a pawn. 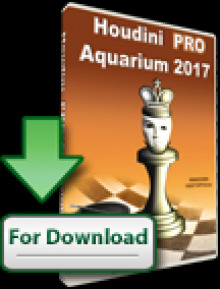 After winning two more pawns, the Russian Grandmaster gave one pawn back in order to weaken his opponent’s kingside in the endgame. After the queens came off the board, the rest was a matter of technique. Realizing that he couldn’t stop his opponent’s pawns from queening, Nakamura resigned on move 89. One of the most interesting battles petered out to a draw. Mamedyarov complimented both himself and his opponent, comparing their move to engine moves. The Azeri grandmaster felt that he was better out of the opening but played too actively and found himself in some trouble in the endgame. 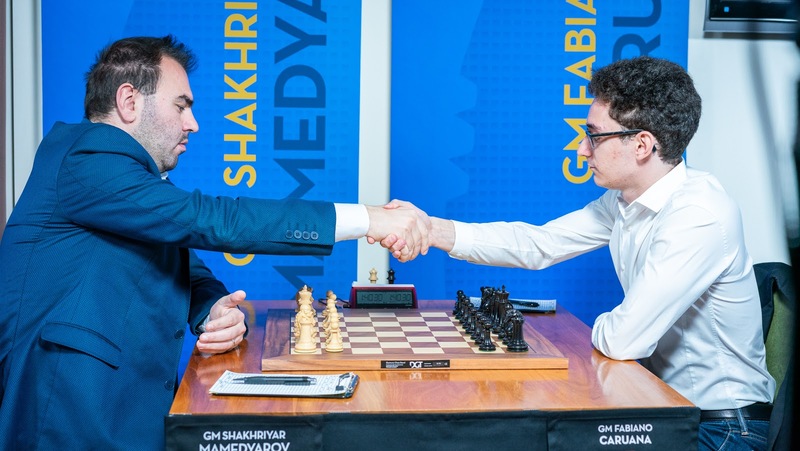 At one point, Caruana could have repeated the position and ended the game in a draw, but after two repetitions he decided to keep the game going. 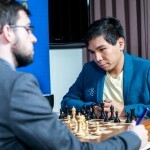 Mamedyarov praised Caruana’s decision, explaining that it’s a great way for him to train for his upcoming World Championship match against Magnus Carlsen, who is known for his unique ability to grind down his opponents. Although the Berlin endgame is a popular choice among the top players, it was only the second time it appeared in this tournament so far. Vachier-Lagrave repeated a line he had previously played, but retreated his bishop on a different diagonal, trying to veer the game off in a different direction. The American felt that he needed to be careful in order to avoid any complications and was able to find the most precise moves to exchange all the pieces and head into a drawn bishop endgame. After suffering two losses, this draw for Sergey Karjakin was just what the doctor had prescribed. He chose a long theoretical line that lead into a rook and bishop endgame where black had a few problems to solve. The former World Champion didn’t have many difficulties finding the precise move to exchange the problematic bishops, transitioning into an equal rook endgame. A draw was agreed with a threefold repetition. The Armenian Grandmaster decided to once again start the game with 1.e4, a move he’s been loyal to as of late. Magnus Carlsen explained that the critical moments came early in the game and after the “little squirmish in the center” it was all pretty quiet. He thought that white was slightly better in those positions but there was no way to make progress. 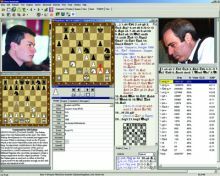 There was one critical moment in the game when Levon Aronian could have forced his opponent to give up his queen in exchange for two rooks, but even though the engines gave white a big edge, neither player was too concerned about it. The World Champion also admitted that he was too excited after yesterday’s marathon game and wasn’t able to sleep well, so the early draw was a welcome result.